More than one third of adults 65 and older fall each year in the United States. 27,747 older Americans died due to an unintentional fall In 2013 – 417 of those were in NJ. Each day in NJ, an average of 202 older adults 60+ are treated in emergency departments or as inpatients due to a fall (Center for Health Statistics, 2013). In NJ, 77% of falls admitted as inpatients were 60 or older (Center for Health Statistics, 2013). 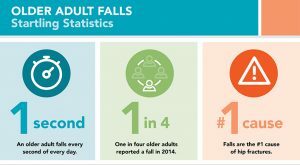 Falls are the #1 cause of brain injury among older adults. Falls are a serious public health problem. Falling, and the fear of falling, can lead to depression and hopelessness, loss of mobility, and loss of functional independence. Examples of injuries resulting from falls include fractures and intracranial bleeding. Often, people do not fully recover to their prior level of function or may not survive at all. Some populations are at greater risk than others. The largest & fastest growing group at risk is the geriatric population. There are many other patient populations that would benefit from fall prevention including the neurologically impaired patient. An example of a neurologically impaired patient is someone with neurological disorders brought on by diabetes or stroke patients. Early intervention to those at risk can make all the difference in avoiding a fall which leads to more health issues or even unnecessary death. In addition to working with local doctors who will prescribe treatment for the variety of gait and balance related conditions to prevent falls, Care Right There Home Healthcare provides a FREE In Home or Facility Fall Risk Assessment. Our team will examine your home and work with you to put remedies in place that prevent falls. Our Nurses leading your FREE Assessment will even examine your medicines to insure that the type of medication or combination of medications are not putting you or your loved ones at risk. Our Aides are trained to help clients mobilize, transfer, and assist with all activities of daily living (ADLs). Call Us Today at 856-244-7722 so that we can begin to help you with our Fall Risk Prevention Program and guide you through NJ State Health Programs.